Robotic Process Automation (RPA) is a game changing technology for process optimization and automation. In the upcoming blog series RPA experts from Capgemini Consulting will give insights into market trends, best practices and a lot of first-hand client experiences. This initial blog article deals with the importance of Operating Models for sustainable benefits from RPA. What can you expect from an RPA project? There are good reasons to already build the foundations of an Operating Model before starting RPA development on a larger scale. 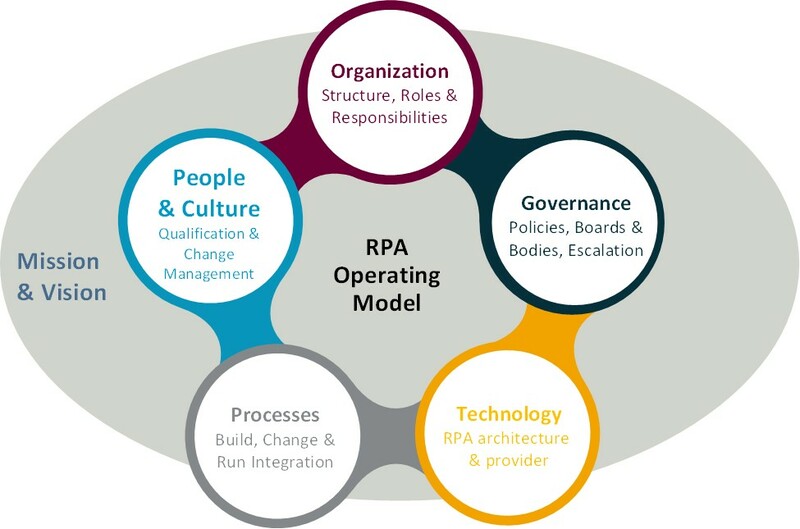 What does an Operating Model for RPA cover? Simply put the RPA Operating Model (OM) is the „blueprint“ of your organization. You may call the result a Center of Excellence or Center of Expertise. However, think about the following 5 dimensions, each of which focusing on specific aspects of your Operating Model. Will your RPA services be built and delivered from a central expert team or a decentralized organization? Is your RPA team for build and run process closely positioned to Business or IT? What are the main roles and their responsibilities in your RPA organization (e.g. Business Analyst, RPA Designer, RPA Controller)? What escalation paths and quality gates are needed? How does your RPA solution integrate into your existing IT landscape? How can a standardized demand process help you to structure your RPA pipeline? What processes are needed to achieve high benefits in execution of robots by reasonable effort in development and maintenance? How to communicate change and when to set up an internal qualification concept for employees? Of course this list does not aim to be holistic, as there is much more to specify before launching a CoE. Why is an Operating Model necessary for sustainable success? Running RPA Services is comparable with running a small Shared Service Center (SSC). Only if roles, processes and frameworks are clearly defined, the management has the option to control and steer its RPA CoE. Only if KPIs have been defined, anchored in development guidelines, measured during robot execution and reported in a structured way back to the management, an understanding of real benefits and costs is possible. Only if you know about your drivers behind costs and benefits, it is possible to make the right adjustments on organizational procedures. What will happen without a defined Operating Model? Based on my experience companies without a defined OM behind their RPA program will have a hard time to achieve sustainable success as they will face issues in running and maintenance of robots after some time. The initial build of robots usually seems to work out fine in most cases. However, often they will find out, that not all automated processes were suitable for RPA in the first place. This will lead to low utilization of these robots. Also maintenance may become an issue as the code of every robot is not based on agreed standards but represents the individual programming style of each developer. At this point of time it is also quite a stretch to patch omissions, which have been made in the first place. So how to start with an Operating Model? Of course the design and scope of an OM should be strongly related to the size of the RPA solution. If the RPA team basically is a one-man show, you need less regulations than working in an international or cross-organizational team with many different stakeholders. Nevertheless, a basic foundation of the OM behind an RPA solution is key to scalability and sustainable success for any RPA project. Last but not least make sure the RPA OM fits into your overall organizational strategy for business, services and IT. This article was written by Fabian Bauermann.